The Scharf family were among the early settlers in Goulbourn Township. They are in the 1820 census for Goulbourn. March, Nepean and across the river at Templeton. who settled at Hazeldean circa 1820-21. Do you have any information on the family before 1820? Many thanks for your reply. Yes, please add my enquiry to the site. Mr. Scharff says in his e-mail, above, that his Scharff ancestors came from Old Leighlin. with his grandfather, Thomas, at Old Laughlin (sp?). the Ottawa area c. 1820.
and confirmed back to 1515 in the Leighlenbridge,Ireland area. family research is attributable in the most part to Darryl. holiday season. Looking forward to hearing from you. The gravestone has been cut and shaped from a beautiful slab of “Kilkenny Blue” sandstone. Saturday 21st March as the most convenient date to suit the needs of most interested individuals. of some death years. Those details can be added when confirmed by future research. collaborative family enterprise by all of you. Thank you. I will ensure that appropriate photos are taken to record the gravestone and event. interested relatives before time, health and gravity bring me to a halt. photographs are taken to record the event. I will report back upon my return home on 4th April. The project has been completed! The memorial stone looks great and has evoked much comment. descendants of those named on the memorial stone. Everyone was pleased with the attendance. describing the interpretation of the groups of names on the stone. Agnes Scariff-Lalor will cover Ireland and the UK. The cost will be about 50 euro / $100.00 AUS with payment up front. orders. Please be patient as this could take several months to coordinate and deliver. My congratulations and thanks to all involved. You have made it a great success. 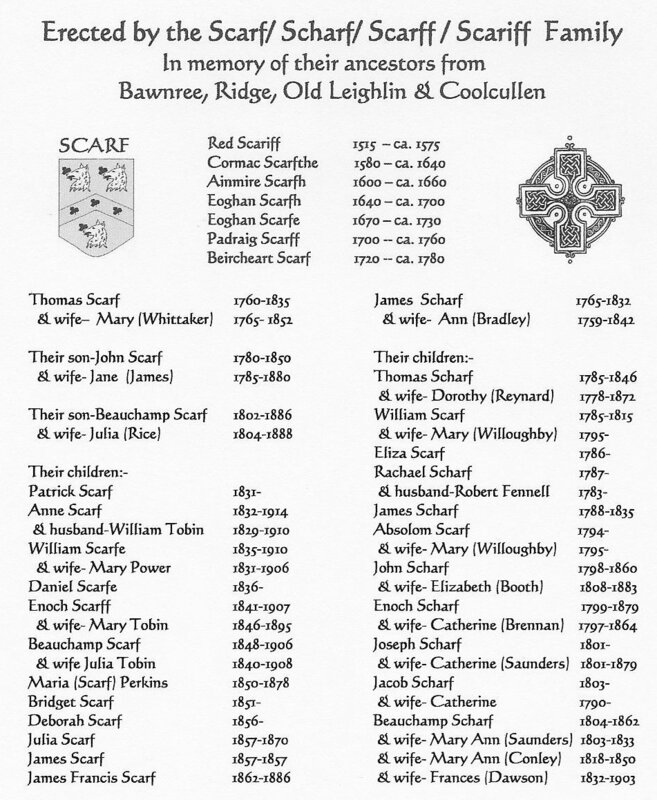 Scarf/Scharf/Scariff family of Baunreagh and Ridge, Old Leighlin parish, Co.
and Coolcullen before 1820 when they emigrated to the Ottawa Valley, Canada. I am saddened to be the bearer of the news of the recent death of Dellray Scarf of Canada, as the result of a motor vehicle accident. The following  text is part of an mail I have sent to his son Jesse and daughter Jamie, on behalf of our group, expressing our support. Words are never enough to express the myriad thoughts and emotions evoked by the passing of close family relations. character and enthusiasm which he generated. He was a contributor, not a user of people. been a major contributor for many years as a valuable family resource. He will be missed by many. Though my direct personal contact has been  constrained by distance, we did manage to maintain contact via the internet. another wonderful contributor who has also passed on. On behalf of the extended Scarf family.